Visual meteor observing has traditionally been seen as a low cost and easy way to get involved in astronomy, particularly when visual observation are involved. Imaging was expensive, both in the initial outlay for camera(s) and in terms of wasted film exposures. Recently however, advances in both DSLR and Video camera technology have changed this. Here we will cover detecting meteors with video cameras. The results of video observing can be particularly impressive. 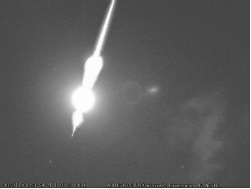 A still image of a fireball can look good, but is easily surpassed by a video showing a fireball moving across the sky and exploding. 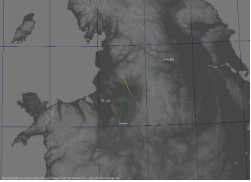 Furthermore software now exists that can automatically recognise the genuine meteors, exclude aircraft and satellites and even upload data to shared servers for scientific analysis. This is one area that video observing is different. By collaborating with other observers it is possible to analyse video of the same meteor obtained from different locations. Using triangulation, it is then possible to determine the meteor’s speed and trajectory as it hit the atmosphere and from this to work out the original solar system orbit of the meteoroid. In addition to improving the understanding of major meteor showers, such work is also proving invaluable when it comes to the identification of minor meteor showers. Precision analysis of the video allows observers to determine which are genuine and which were spurious. Additionally we should remember that meteor showers are dynamic with activity waxing and waning as the orbit of the meteoroid stream changes due to the effects of gravity and radiation pressure. Hence there is considerable value in continuing to monitor meteor showers year after year. Figure 3: The ground path of the Taurid fireball, determined via triangulationFor example, nowadays the Geminids are probably the most reliable and spectacular meteor shower however, they were not active 200 years ago. How will they change in the next century? What new showers will become visible? There are now networks of collaborating video observers all over the world, often working together and uploading data to the International Meteor Organization. In the UK, NEMETODE and UKMON are both active in this field. William Stewart who is part of the NEMETODE network has provided much of the information contained in the following guide. Updates have come from Mark McIntyre who is a member of UKMON. Its a lot simpler than it used to be … and one type of video camera is in widespread use. Video observations obviously require a video camera and for a number of years models have been available that can capture excellent live views of the night sky without the need for image intensifier technology (thus reducing cost and complexity). 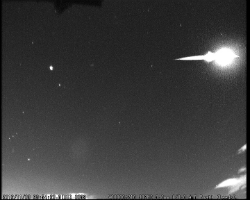 Live video (as opposed to a camera that integrates an image over a period of a few seconds or minutes) facilitates not only a precise measure of the meteor velocity but also an accurate time for when the event occurred, key requirements when determining the original orbit of the meteoroid. For many years the camera of choice for many has been the Watec 902H. It is sensitive, robust, is readily available with 1/2” and 1/3” format sensors and provides 25 frames per second at a resolution of 752 x 582. As of 2019, used units can be found on eBay for around £90. Other cameras also work, such as the KDM-6101G which has a similar specification and costs around £65 (though these cameras are becoming scarce). There may be other options but these two models are known to work. Additionally, in 2018 a DIY design based on the Sony IMX291 chip was put together by the Croatian Meteor Network. This is still being evaluated by UKMON and the software required for this is rather different. This page will be updated with more information in the coming months. It is not possible to know in advance where a meteor will occur and so the natural instinct is to use a wide angle lens to maximise the chance of a capture. However, this will only detect bright meteors, whereas a lens with a longer focal length, while having a smaller field of view (FOV), will detect fainter meteors – and for every bright meteor there are many fainter ones. Typically lenses with a focal length in the range 3.8mm to 12mm are employed, yielding a respective field of view (FOV) of 80° to 20°. A longer focal length lens is better suited to a suburban location that suffers from light pollution and has, due to local obstructions, limited options for where the camera can be pointed. Bear in mind that lenses are designed for cameras with a particular sensor size and so using, for example, a lens for a 1/3” sensor on a 1/2” sensor camera will result in vignetting and significant distortion/degradation of the image at the edge of the FOV. Another consideration is the focal ratio or “speed” of the lens: f/1.2 or better will give good results. The sensitivity of camera sensors has now increased to such an extent that manufacturers no longer have demand for ultra fast lenses. Lenses of f/1.2, 1.4 and 1.6 are readily available and fast lenses are still produced by manufacturers such as Computar (TG3Z2910FCS-IR), Tokina (TVR0398DCIR) and Fujinon (YV2.8×2.8LA-SA2) – expect to pay around £50. 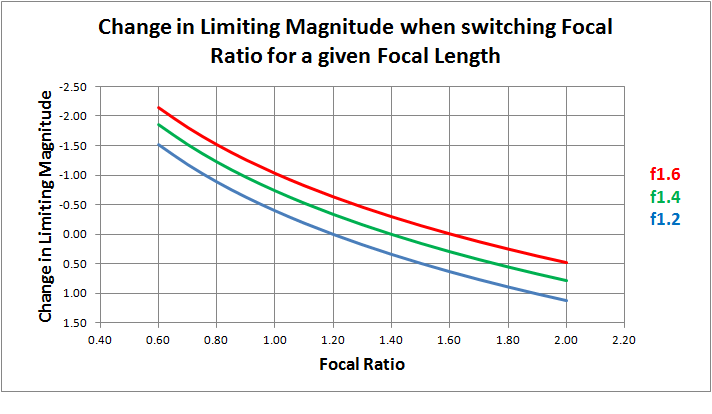 Figure 5 shows how the limiting magnitude changes with focal ratio for a given focal length. As can be seen, a lens of a particular focal length operating at f/1.0 will detect meteors a full magnitude fainter than one of the same focal length operating at f/1.6. A faster lens can make the difference between detecting 20 meteors per night and detecting 50 – 60. Whatever is chosen, to allow accurate astrometry to be performed on the meteors captured, the camera and lens combination must be capable of detecting stars down to magnitude +3. Due to the transient nature of meteors and the detection / triggering capabilities of the software, the faintest detected meteors are typically 1-2 magnitudes brighter than the stellar limiting magnitude. The good news is that you don’t need an expensive high spec PC. You do, of course, need to make sure that you have enough storage capacity to hold the recorded meteor videos. The capture software is not processor intensive; hence typical desktop PCs from the early 2000s running Windows XP will suffice The NEMETODE Ravensmoor Node utilises IBM ThinkCentre M51 3.2GHz P4 HT units which can be picked up for around £40. Typical CPU load is around 20% and the only modification from the standard specification has been to add additional RAM and a 300GB Hard Disk Drive (HDD). The current Meteor Section director runs the software on a ten year old Windows7 PC, again with some extra memory and a big hard disk. There are a number of choices available for the acquisition software and these determine the choice of interface card to allow the video signal to be streamed into the PC. Your choice of software will depend on whether you are planning to become part of a video observing network and the software already in use by the network. Irrespectve of software choice, the way it works is to read the video continuously into memory and look for frames where there is rapid movement. The data is then saved into short video clips “bracketing” the motion (something like 30 frames before and 30 after the motion is detected). This analysis is automated with minimal user interaction required, though its worth going through the clips the next day to weed out the occasional bird, aircraft or satellite flares. The first software option is MetRec (Meteor Recogniser). This is a well established and widely used program that not only has excellent motion detection capabilities but also performs real time monitoring of local seeing conditions. The software determines brightness, velocity and equatorial coordinates and assigns probable meteor shower association based on IMO data. MetRec is a good choice for observers who don’t plan to be part of a network, but requires the use of a particular type of frame grabber card (Matrox Meteor) which is no longer produced. Second hand units are available but these typically cost around £125. A better option is SonotaCo’s UFO Suite. DO NOT be put off by the name – it is nothing to do with ‘flying saucers’ – it is a set of highly capable programs designed for capturing and analysing any objects moving through the atmosphere. UFO Capture software has also been used to detect other atmospheric phenomena such as sprites above lightning storms. This software is widely used by most networks but unlike MetRec does not monitor local seeing conditions. Once videos have been captured, they are transfered to a separate programme UFO Analyser for initial analysis. 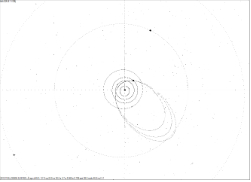 Data from multiple observers can then be loaded into UFO Orbit, which determines parameters for the radiant, velocity, trajectory and prior solar system orbit. UFO Capture is priced in Japanese Yen but normally costs around £125 (following an initial, free, 30 day trial period). UFO Analyser and UFO Orbit are free. UFOCapture interfaces with readily available TV cards and USB video converters. The NEMETODE network make use of Osprey 210 Video Capture Cards, which can be bought online for under £30. USB based devices such as the ClimaxDigital unit (£20) have also been successfully used by UKMON and NEMETODE. The UFO Suite is a good choice for observers operating as part of a network who take steps to ensure common volumes of the meteoric layer are simultaneously observed. It generates files in an internationally-recognised standard which allows data to be shared with other networks too. In the NEMETODE set up, a laptop style power supply was originally used to convert 230V AC to 12V DC (to power the camera and the iris on the lens), though the more permanent installation at Ravensmoor has now switched over to a dedicated, higher current, enclosed power supply that supports three camera systems. The Leeds node uses 12V DC transformer plugs. A budget of around £300-450 (depending on how much you already have, such as an old laptop) will purchase a highly capable system that can generate good scientific results. This is not a trivial amount of money but for the opportunity to generate real scientific data, its a pretty reasonable price. The great advantage of video meteor monitoring is you can automate it. The first step is a weather-proof enclosure for the camera and lens. Standard off-the-shelf security camera housings are ideal as they include dew heaters, though you may need to seal them thoroughly (they’re designed to point down, not up!). 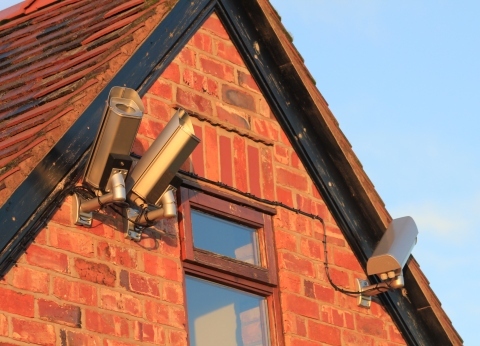 NEMETODE cameras use units from MAP Security sourced via eBay – search on “ebay map security cctv enclosure” – and have found them to be excellent. The Genie TPH2000 and TPH1500 are also suitable. To avoid damaging the sensor, the camera must be switched off whenever the Sun might be in the field of view. This can be done either with a simple timer or using light-sensitive switches available for around £5 from ebay or amazon. Of course if your camera faces north this won’t be needed. The software itself can then be started up and left running. UFOCapture has a facility to schedule detection during night hours only, and will estimate dawn and dusk based on your location. Note: You will need to check the PC regularly to make sure the hard disk doesn’t fill up ! Each video is typically about 50-100MB in size, and the cameras are quite sensitive so during busy showers you may capture several gigabytes a day. Its best to move the videos to an external hard drive every few days to avoid space problems.